In a world that increasingly sees the use of insensitive and racially charged terms as being unacceptable in public speech, the manner in which the media covers issues regarding Roma still trails behind all across Europe, with expressions ranging from the patronizing to the down-right offensive still being the norm in the media vernacular. Rather than being just an issue of journalistic ethics, some of these ill-conceived choices of words have very real consequences on the way the Roma are perceived and treated. In recent years, the mainstream media’s level of outright hate-speech against minorities has somewhat subsided, while still, predictably, thriving in nationalist publications and independent blogs. While this new-found political correctness should definitely be applauded, it seems to have skipped the Roma, who are still treated in a horrendous manner by virtually any news story. Even apparently benign use of language should also be more deeply scrutinized, being very often but a legal-protection measure, rather than an attempt to put an end to discrimination. In Romania, for example, the National Council for Combating Discrimination passed a law in early 2013, according to which the use of the term țigan (translates roughly to “gypsy”) was considered discriminatory and was punishable with a 600 Euros fine, which was raised to 7000 Euros a few months later, “following pressures from the European Union”. But scouring over several articles from the mainstream media from all across Europe that involve, in one way or another, Roma people, one immediately starts to notice recurring patterns of speech, with the same expressions and wordings resurfacing across publications, mediums and even languages. These speech patterns, while avoiding to spell out obviously discriminatory or hateful messages, often carry the same essence by enabling the same stereotypes and using the same borderline-offensive terms, often implying that the presented cases – which should be, through their very definition of being newsworthy, exceptional – are representative of huge, heterogeneous groups and generally treating the Roma as an outside group that just so happens to interact with “the rest of us” now and then, more often than not in an unpleasant manner. Roma from Montenegro in Media. Regardless of the actual content of the article, a pattern starts to emerge after reading even just a few, with Roma being always depicted as alien and having bizarre customs, even when referring to locals. The author often tries to convey a sort of mock-concern about their well-being (the conditions in which they live are always “inhumane”, the number of children they have is always “inordinate”), while actually parading these facts in a P.T. Barnumesque manner that does nothing to address the social factors that created this gap between reader and subject, but being more of a perverse celebration of said gap. The recent case of Maria, the “blonde angel” that was living in a destitute Roma community was such a great hit because the mere idea of a non-Roma child (or even a blonde, more easy to identify with Roma child) enduring those conditions was bloodcurdling for the readers, while the thousands upon thousands of Roma children who experience the same forlorn life are easily catalogued under one of those “harsh realities” that “others” always seem to endure, like Darfur or Haiti, where one can do little more other than feel sorry for them and get on with their lives. Noted UCL anthropologist, Dr. Michael Stewart explains the concept as a mechanism by which a majority is being turned against a minority, a way of pinning all possible problems on a vaguely delimited “other”, perceived as working against the national interest of the majority. While most associated with Hungary, due to its intense and shocking use by far-right party Jobbik and by the associated, now defunct, far-right paramilitary Magyar Gárda, the idea of “gypsy criminality” (cigánybűnözés) appears in most countries with a Roma population, while being more present in Eastern European countries, the accusations usually being made against immigrants in the West . The term also sees use in Bulgaria, where it has become a staple of speeches by far right and nationalist parties like the BMPO (Bulgarian National Movement)  or Ataka  and going as far as trying to legally ban the Bulgarian leg of the Helsinki Committee for becoming “a PR for gypsy crime”, as well as in the Czech Republic, where it has instigated violent attacks on the Roma population. However, with the migration of Bulgarian and Romanian Roma towards Western Europe, tabloids have jumped to the opportunity to create a super-villain, both immigrant and Roma, with the notoriously anti-immigration The Sun running headlines like “Dirty, drunk and defiant…. meet the Romanian gypsies defiling Park Lane”, depicting an oppressed and downtrodden minority as a threat to the very notion of British life. The exoticism card is often played, making the Roma seem more alien, even when the coverage occasionally deals with something else other than poverty and crime. In stories that cover events taking place in the families of rich Roma leaders, for example, like marriages, engagements or funerals, the term “tradition” is overused to the point of ridiculousness, appearing once every few other words and the lavishness and exuberance of the gathering is overplayed, despite not being incrementally more eccentric than those of non-Roma of the same social statute. More akin to 19th century “human zoos”, where non-Europeans were publicly exhibited as the “bon sauvage” for shock-value, than to 21st century journalism, these pieces that display the lifestyle of the super-rich Roma, insist on the same argument, really, by making a point of their differences. 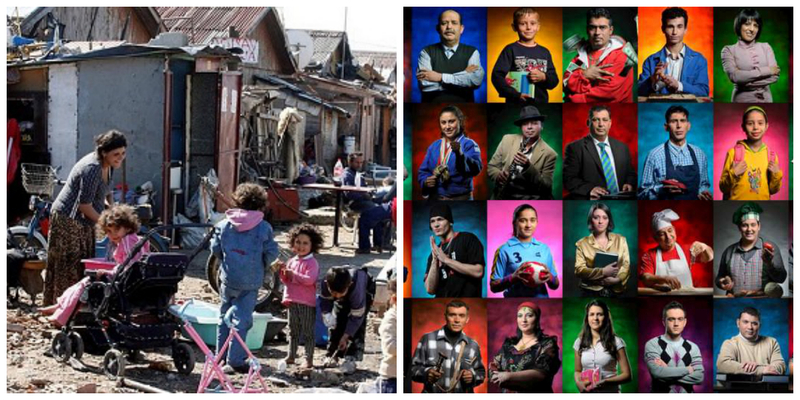 Their different customs, the different way they decorate their homes, the different way they treat each-other is presented as proof that the difference between Roma and non-Roma is inherent and is created by internal factors, seeing how we are shown that even the affluent Roma are “others”. The above Romanian law dealing with the use of the word țigan was depicted itself in the media either in a tongue-in-cheek manner – such as using the word “discrimination” in quotes or wondering if this will also affect Roma who call themselves țigani, or in a vaguely outraged manner, focusing on the coercive, top-down nature of these regulations. But it was always written in a way that seemed to only be addressed to non-Roma and the effect this will have on them – “What will happen to YOU if you call one of THEM a gypsy”. Only a handful of publications could be bothered to mention the fact that the law covers many areas, such as the refusal of services by private and public actors to any person based on their race, ethnicity, sexuality of disability, and rather ran with the more simple and seemingly more outrageous stipulation that saying a word will cost you money, as demonstrated by how the twelvefold increase of the fine was much more widely reported than the original law itself. The reason why such a law was even necessary is the rampant use of derogatory terms by the media when covering stories related to the Roma. The word țigan, despite being offensive, is accustomed to such an everyday usage, that complaints against its use are usually subject to accusations of excessive political correctness. In Bulgaria, the use of the similar “Цигани” is also used heavily in the media, despite its offensiveness and its association with the vile stereotype of the dirty, dark characters that roam at the edge of society and it usually being accompanied by terms such as “beastly” or “dark”. In Romania, one of the most prevalent speech points concerning national identity in the context of European integration was the delimitation of non-Roma population from the Roma. As the ascension to the EU came to fruition, many Romanians of both Roma and non-Roma origins started to travel to the Western part of the continent. In part due to the further biases in the Western media, where crime committed by immigrants is overrepresented, Romanians and Bulgarians started being seen as criminals that have come to pillage the civilized world, a situation that a large segment on the population blame the Roma for. Fueled by Western Europe’s wide-spread ignorance regarding the Roma, Romanian society in general and media in particular gets highly worked up by any coagulation that might appear in the foreign media and tries to claim that most crime committed by Romanians abroad is actually the work of Roma and, as such, should not be associated with Romania. This moral panic is increased by recurrent media depictions of “The gypsies who shocked Europe” that claim the shanty-towns populated by Roma at the edges of European capitals as the main reason that Romania and Bulgaria are blocked from joining the Schengen area. This claims is also repeated in the Western media as well, and several French and German leaders have alluded at different time that the “Roma issue” is a factor in the Schengen admission of the two countries. Despite the ridiculousness of this claim which, even if true, would mean that Romanian Roma are denied their nationality and should only be identified by their ethnicity, it is a widely-held claim and one can often find politicians and media outlets who discuss how Romania should improve its image. Unfortunately, the message they convey is not “we’re not all criminals”, but “we’re not all Roma”, which, for many of those who say it, is the same thing. This is one of the reasons that led to most media sources to refer to the ethnicity of the actors when covering a new story, even when it is not directly relevant. While rarely coming off as outright racist, the use of loaded terms such as “our conationals” or “ethnic” creates further artificial and arbitrary barriers between Roma and non-Roma. This is indirectly strengthening the above-mentioned stereotype, by making the public sigh with relief when finding out that those apprehended for attempting to sell babies in Marseille, for example, were Roma, since that makes them see themselves absolved by some of the collective guilt, considering that the subject’s identity as Roma supersedes their identity as Romanian. Media depiction of Roma continues to be mainly negative, even if less directly so, constantly making use of loaded terms and speech particularities that make it clear to the consumer that the Roma are inherently different than the average reader or viewer. In doing so, it propagates stereotypes and biases that already exist in the mass perception, doing nothing to shake the status quo, but actually increasing the aversion towards Roma by making them seem less relatable, and thus more alien. Despite calls against “political correctness”, it is very obvious that words are not “just words” and that their use can significantly improve or damage the way a majority behaves itself towards a minority. Despite the unification role that media had been able to take at times, with thresholds like the appearance of nation-wide newspapers or the radio making individuals more in tune with one another, the systematic negative depiction of Roma, used either for amusement or for trying to shift the blame for one’s own condition is a form of self-fulfilling prophecy, pushing Roma further and further from being treated as full citizens, thus creating further stories of destitution and exotic. Media has a huge say in forming the opinion of the public but, unfortunately, in the case of the Roma, it is still far from using its powers for good. IT IS A HISTORICAL FACT, THAT THE POOR AND INNOCENT ROMA PEOPLE HAVE BEEN EXPOLITED BY THE ALIENS , SINCE LAST SO MANY CENTURIES. NOW THE TIME HAS COME THAT ROMA SHOULD GET – UP UNITEDLY AND DEMAND FROM THE ALIENS TO STOP ANTI – ROMA PROPAGANDA, OF HATERED & DISCRIMINATION AND THEY MUST GIVE THEM EQUAL – RIGHTS WITH THE LOCAL PEOPLE WHERE-EVER THEY LIVE AND ALL OTHER FACILITIES THOSE ARE ENJOYED BY THE LOCAL PEOPLE !! !